Queen Latifah, Salt-N-Pepa, and Missy Elliot will also be given awards. VH1 is reviving its Hip Hop Honors program this year to pay homage to some of the genre's most legendary women. 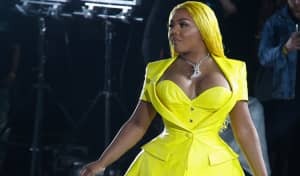 The theme of the event is All Hail the Queens and Lil Kim has been announced as one of the honorees. This announcement follows the news that Queen Latifah, Salt-N-Pepa, and Missy Elliot would be receiving tributes of their own during the special. Kim will be recognized for her amazing music catalogue and influence in the fashion world. The awards will air on Monday, July, 11 at 9 p.m. EST on VH1.